Forsythia Intermedia ‘Lynwood’ is really the star of the genus and Forsythia ‘Beatrix Farrand’ is one other the better known varieties. Deciduous small shrubs grown for the masses of yellow flowers on arching stems in late winter to early spring. The green foliage that follows is an added feature. Related to the Olive tree Forsythia are a wonderful plant for the garden border and are equally at home as a feature shrub. And those wonderful yellow flowers in late winter to early spring make it well worth a place in the garden. Remember that these shrubs will reach a height of over 3m and need a little space. 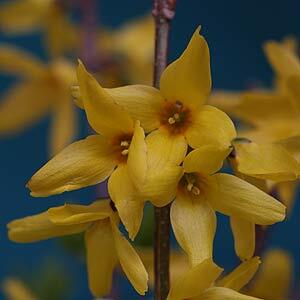 Growing well in full sun to part shade Forsythia are hardy and frost tolerant. A natural growth habit will look great, however left unpruned, Forsythia Intermedia Lynwood can get a little out of hand. So how do we prune to get that natural look. Commence by pruning on a regular basis, remove and dead or damaged growth, and then up to 1/3 of the oldest (tallest) growth at the base each year. This way the you are continually regenerating the bush. How about a really old Forsythia that is totally out of hand ? Either treat this the same way, or be brutal, and cut it right back the ground all in one go.